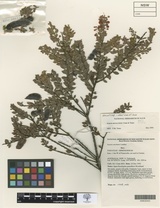 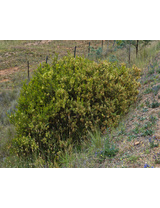 Description: Bushy shrub, usually <1 m high, sometimes to 1.8 m, with ± erect branches; branchlets terete, ridged, densely yellow-hairy. 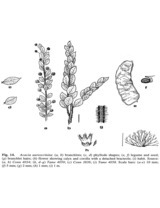 Phyllodes ± coplanar with the branchlet or rotated to 30–60o from the branchlet, elliptic to broadly elliptic or occasionally ovate-elliptic, 0.8–2 cm long, 4–12 mm wide, green to grey-green, hairy, midvein subprominent, lateral veins faint, margins ± flat and yellow-green, base slightly oblique and slightly asymmetric, apex acute mucronate with mucro <2 mm long; 1 gland mostly to 1 mm above base or occasionally absent. 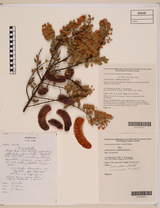 Inflorescences 1 in axil of mostly ± reduced phyllodes; peduncles 7–16 mm long, pale yellow-hairy; heads globose, 18–30-flowered, 4–7 mm diam., pale yellow to cream-coloured. 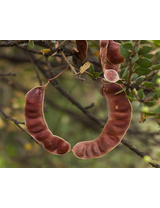 Pods usually slightly curved, 2–8 cm long, 12–17 mm wide, leathery to firm, glabrous, margins ± flat; seeds transverse; funicle filiform. 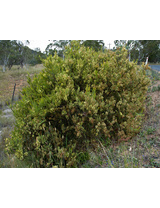 Distribution and occurrence: from east of Cooma to Shoalhaven River. 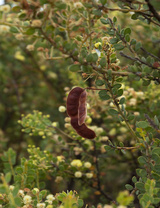 Grows in Eucalyptus woodland often on ridge crests and steep valley sides, mostly in stony clays. 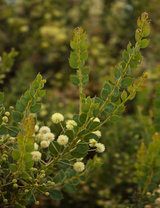 Similar to Acacia uncinata, but distinguished by its lower, much-branched, bushy habit and smaller elliptic phyllodes.